Four FOW in the mooring cove at the back end of the Little Mineral arm. I didn't measure, but he was about 19-20 inches and would have made a nice fish. I'll hopefully get a legal shot at him again in the near future. After coming up empty throwing a pencil popper along the North side of the Islands, I set up in 20 FOW just to the east on on the river side of West Island. Once again, nothing. A couple of guides were drifting nearby - one who caught nothing, and the other who caught one nice striper. I did overhear one of them say they had five in the box at that point. 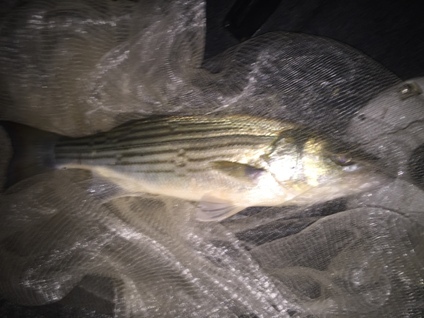 Around 10:30, I gave up on Striper and went looking for Sand Bass. After catching one keeper and a few dinks, I stopped by North Island on the way back to Grandpappy and withdrew three blue cats to make a meal with. The North wind really picked up mid-afternoon and made for a rough ride home. Sunday turned out a little better. After coming up empty on topwater on the south side of Treasure Island, I set up a drift along the West side of West Island. The depth finder looked promising, but I could get any of them to hit. I was going to head up North of the RR bridge for a change of scenery when I noticed a big flock of gulls working just to the east of North Island. What was under them looked fairly promising and there were a lot of small fish hitting the top. No keepers, but I was happy to see the gulls working and pointing out striper schools, regardless of the size. 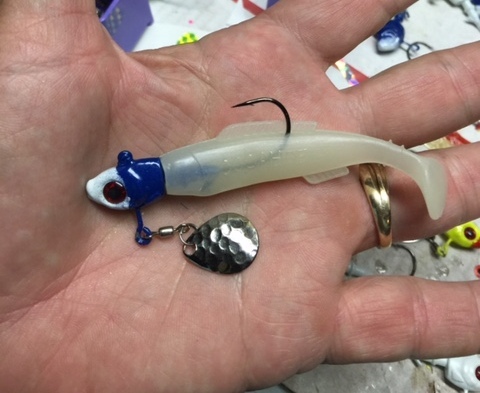 I only had one of these little green swim shad left, so I rigged up a cocktail of various colors on one of the Captain Mack's rigs, and almost immediately caught another fish on the one small green one. Needless to say, I stopped at Academy on the way home and grabbed a few more of these. 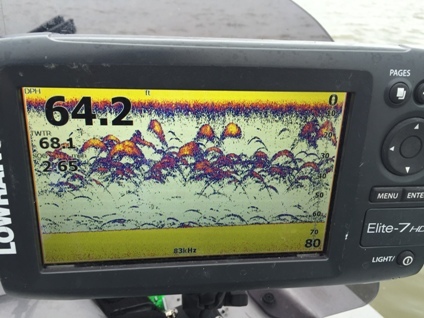 I didn't feel like messing with the downriggers, but in the sonar picture above, I think a 20-25 foot controlled troll might have been somewhat productive with the right bait. I think I'll try downrigging some live shad on a Captain Mack's next time I see this type of activity. 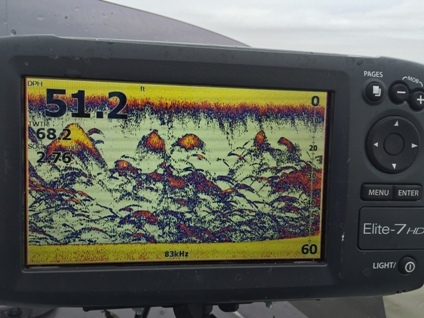 After 45 minutes or so of trolling along with the birds, the depth finder picture changed as sand bass moved in. This lasted another 45 minutes or so with the sandbass hitting just as frequent as the small striper. At the end of the day, I ended up with a decent mess of them, including a nice 16 incher, all on the same small umbrella with little green swim shad. The weather was a lot more tolerable on Sunday as well. I brought decent rain gear, so the drizzle didn't bother me, and the lack of wind made for nice glassy water - especially later in the day. Great report! I'm going to Academy to load up on green. Excellent. Great to see some action cranking up for sure!!!! PS: I resized your pics. Hope that is OK. We like to keep the photos at about 400 pixels are so. Saves server space and we save money on the forum expenses. Great report. I went out Sat morning and marked a lot of bait. So much bait. We fished around the Islands throwing pencil poppers early. Got one blow up from 730 - 830. We gave that up and tried slabs in deeper waters west of the Islands, but no takers. Again, everywhere we went, the graph was dark with bait balls. My buddy switched to a 1/4 once white rooster tail and he must have caught half a dozen sand bass in less than half an hour. I tied one on and caught a few myself. Headed in before noon. No stripers but it was fun being out on the water. Right now it seems they want something smaller with a spinner on it.